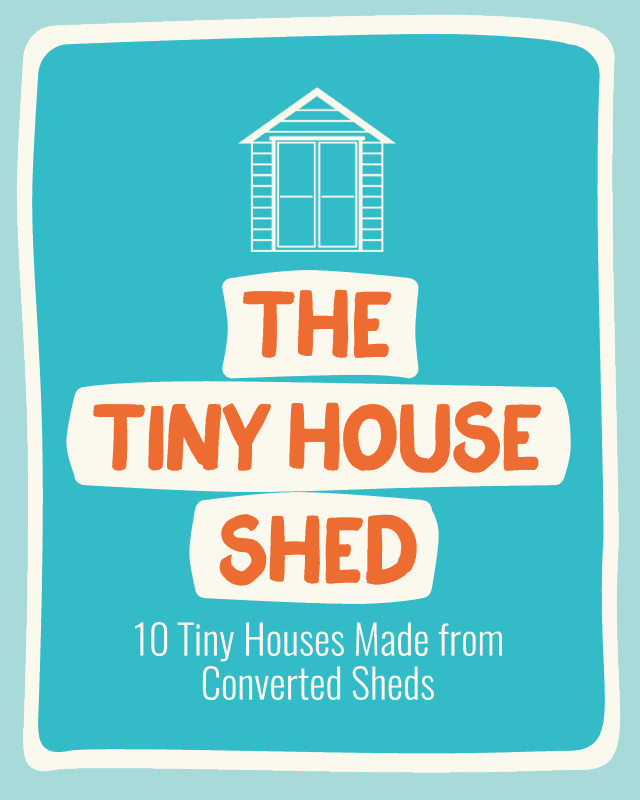 Recently I've been receiving more and more emails asking me about the concept of turning a shed into a tiny house. Can you build a tiny house out of a shed? 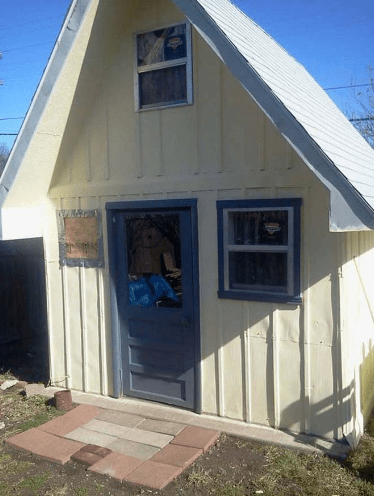 Why would you build a tiny house out of a shed? And should I start my build with a shed? 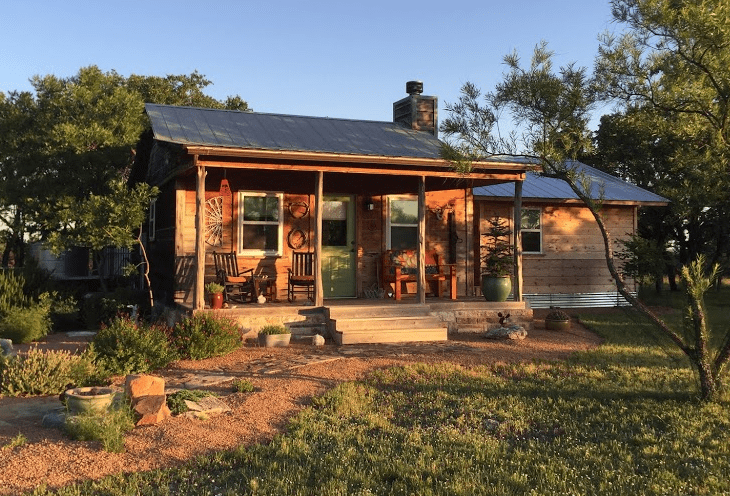 In this article, I'll answer these three questions, and show you ten examples of tiny house shed builds. Q: Can You Build a Tiny House out of a Shed? The short answer to this first question is “yes.” Plenty of people have already built their tiny houses out of sheds. Keep reading to see some examples of turning a shed into a tiny house. Q: Why Build a Tiny House out of a Shed? There are many reasons why you might want to go for the tiny house shed option. 1) It speeds up the build. 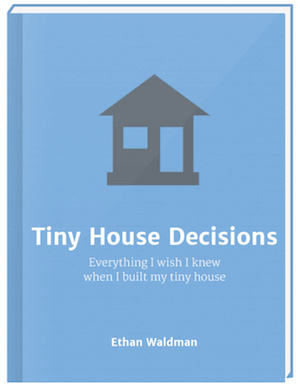 I often advise those who are short on time to speed up their builds by buying tiny house shells. If you have a full-time job, you need to move into your tiny house very quickly, or you live in an area with a difficult climate, turning a shed into a tiny house shed will cut your build time down considerably and, ultimately, mean you can move in much sooner. You'll be able to order and collect your tiny house shed in a matter of minutes compared to the months it'd take you to build something from scratch. You also won't lose any time to newbie mistakes that would have to be undone and redone. 2) It can be cheaper. The chances are that you'll be able to buy a suitable shed for less money than you would be able to buy or build a tiny house shell for. Manufacturers have got shed building down to an art; their processes are streamlined and efficient, and they're able to buy their materials at wholesale prices. This means you should be able to pick up a higher-quality product for less money than it would cost you to make a lower-quality frame yourself. If you need to build your tiny house on the cheap, a storage shed converted to a tiny house could be a simple way to save some money. 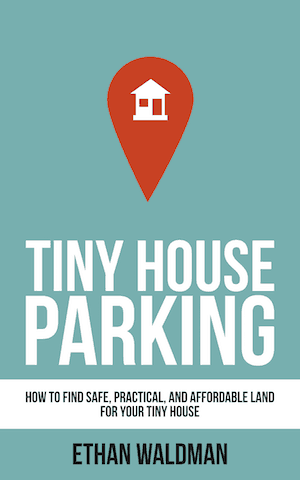 3) Your tiny house might be of a higher quality. Unless you have a lot of experience with construction, any quality shed you buy is likely to be of a higher quality than a tiny house shell you could build yourself. Sheds are designed and built by pros who know exactly what they're doing. It may be worth paying extra for the peace of mind that will come from knowing that your tiny house foundations were built by an expert. On top of that, if you build your tiny house yourself and something breaks or goes wrong, you only have yourself to turn to. But if you buy a pre-made tiny house shed from a manufacturer, you should get a warranty or guarantee. Again, this will give you peace of mind and it could save you even more money further down the road. 4) You might be able to secure financing. It's hard to get financing for projects and things that most people aren't familiar with. While a bank might be perfectly happy to lend you money to buy or build a house, they're likely to be much more reluctant to fund your tiny house build. However, everyone knows what a shed is. And some shed manufacturers provide financing options themselves. 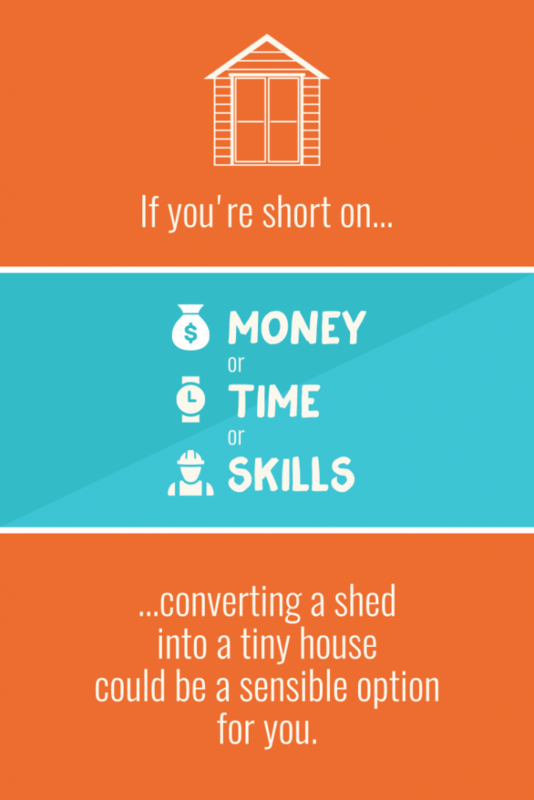 If you're playing the waiting game until you have enough money to build a tiny house, securing financing to buy a shed that you turn into a tiny house could help you reach your goal much quicker. 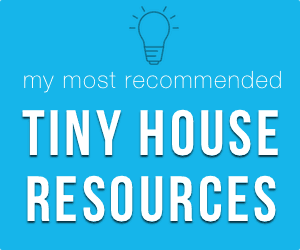 Q: Should I Turn a Shed Into a Tiny House? As we've seen, if you're short on time, money, or skills, a storage shed converted to a tiny house could be a really smart move. That said, if you go this route, you'll have much less say in the design of your tiny house. If customization is important to you, you might not want to start with a shed. If you start with a shed, you won't be able to have much control over the look of your tiny house. You'll also have to design your internal layout around the shed you choose. It's certainly worth researching your options to see what's out there, but if you have a particular layout or style in mind, an out-of-the-box solution isn't likely to work for you. If you plan to tow your tiny house a lot, starting with a shed might not be the best option for you either. Obviously, sheds are not designed to be pulled all over the country. It's therefore important to check that any shed you're considering will be fit for purpose before you buy it. Make sure it's strong enough to be lived in, and make sure there aren't any legal restrictions on its use. Find a suitable trailer for it before you commit to buying it. If you think buying a pre-made shed might be for you, I suggest reading The Shed Option by Tiny House Design. This article contains a list of questions to ask and criteria to check when looking at sheds. 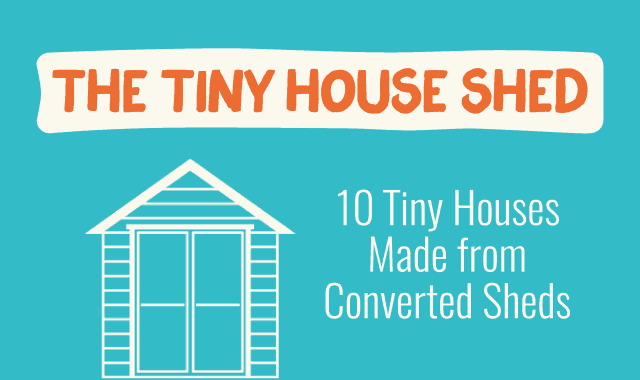 There are plenty of tiny houses out there that were built out of tool sheds. Take a look at these examples to be inspired! 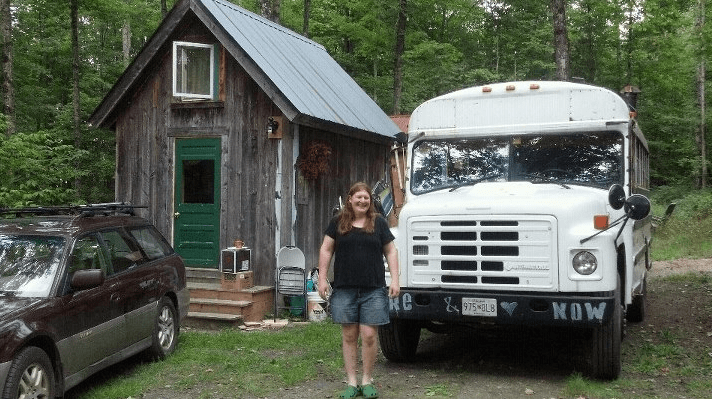 Reader Kathleen got in touch with me to tell me she felt she'd “cheated” at building her tiny house! She bought a 12'x12′ shed, which included a 6′ porch, and converted that into her tiny house. It's still a work in progress, but I think it's looking great! 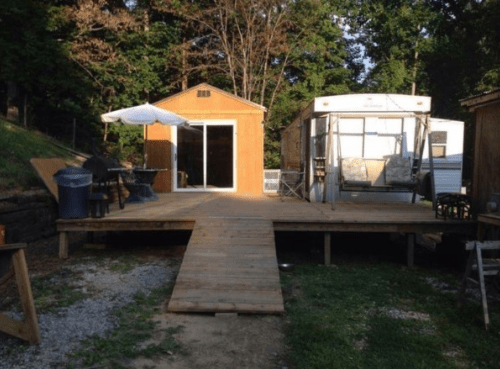 Jackie started her build with a special order pre-fab shed. Her tiny house is extra wide with a roof vent from end to end, and a wheelchair-ready back door. Everything inside the house was reclaimed, homemade, or bought from a budget store. All in all, this tiny house was a great deal! 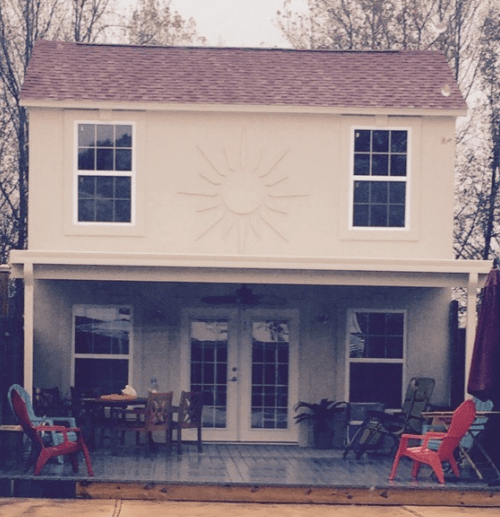 Sue bought a 10'x16′ cedar-sided shed and turned it into a tiny house, adding on a porch deck, plumbing, and wiring. The shed cost $4,700, including tax and delivery. Sue also lives in a 464 square-foot cabin built by the same company that made the shed. She hasn't needed to secure any permits, or pass any inspections, to live in these buildings. This tiny house was built out of a 384-square-foot shed. 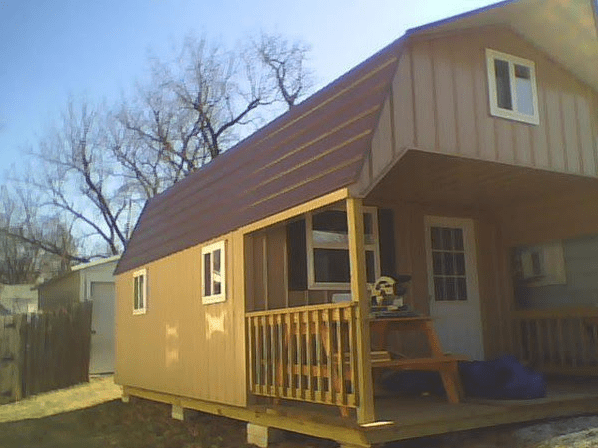 The shed itself cost $5,200 and the total build cost $11,000. This tiny house began life as a Tuff Shed and was finished up by its owners, who had very little construction experience. Catherine and her husband converted a 16'x16′ storage shed into a tiny house for Catherine's 75-year-old mom. The couple added an extra 16'x10′ to the build, installed full-sized appliances, and tried to keep the original storage shed look. Catherine's mother is now living happily inside this storage shed converted to a house! In 2010, Jamie moved back in with her parents but quickly learned that she needed her own space. 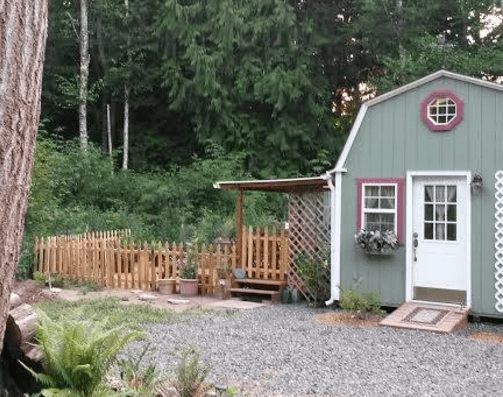 She set her sights on a 10'x12′ tool shed that her stepfather had built three decades ago, and decided to convert it into a tiny house. She replaced the windows and doors, added insulation, wired the walls, and so on, until she had a fully functional tiny house on her hands. 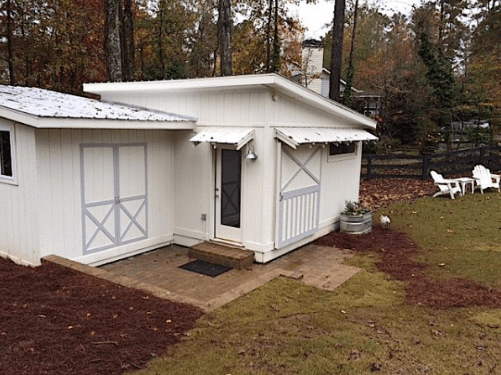 Stacy Thompson bought her 12'x16′ tiny house shed from Better Built Barns. It went up in just one day and then Stacy's friends helped her to finish it. The initial build cost around $7,000, but Stacy has since spent another $10-15,000 on it. I've mentioned this creative pair's ambitious project before. 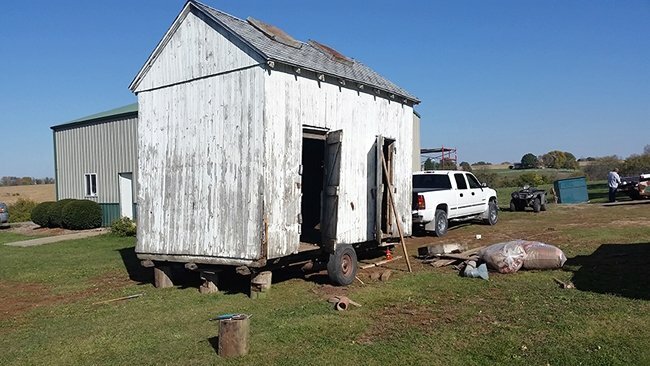 These two environmental studies students built a tiny house out of a 52-year-old granary shed for their senior project, when they failed to secure a loan for their build. The build took just ten weeks and cost less than $500. 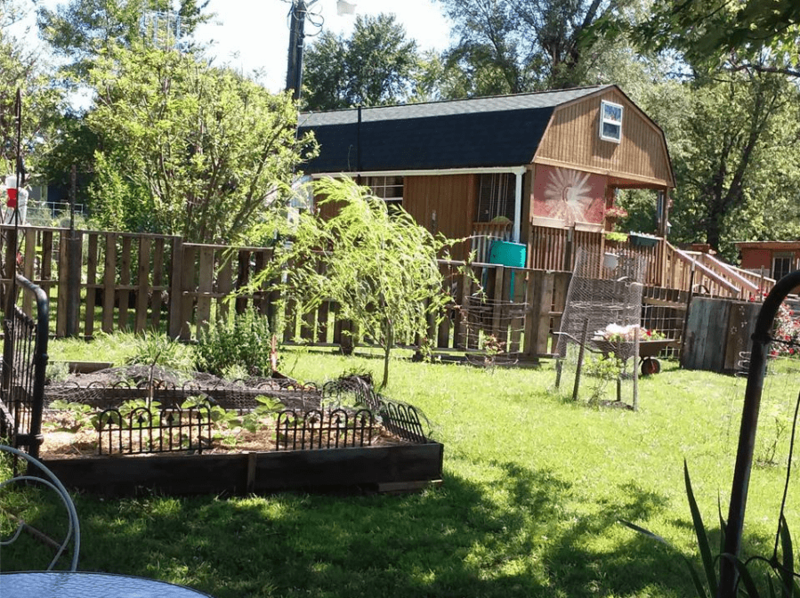 When her daughter and her daughter's five children became homeless, Monica Smith invited them to live in her house, while she moved into her storage shed converted to a tiny house. She did most of the work herself, so this tiny house project didn't cost much at all. While the tiny house shed option is not suitable for every would-be tiny house owner, it does make a lot of sense for some people. If you're short on money, time, or construction skills, converting a shed into a tiny house could be a sensible option for you. 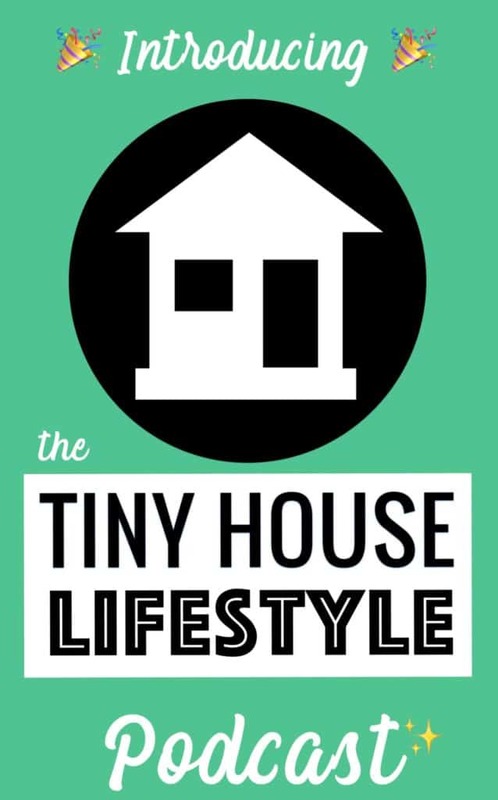 Are you considering building your tiny house out of a shed? Why or why not?